Display shell outputs directly on your background. Is there a better alternative to NerdTool? Is NerdTool really the best app in Desktop category? Will NerdTool work good on macOS 10.13.4? 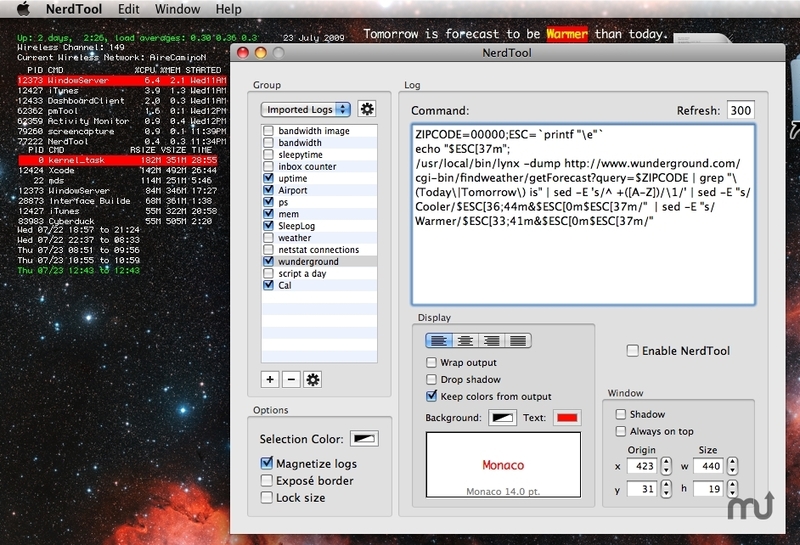 NerdTool is a GeekTool-like application that displays information directly on your desktop. It can display shell outputs, such as system vitals, todo lists, and weather conditions. It has the capability of displaying text in any color, size, and font on any background of any color, and NerdTool supports the use of ANSI escape sequences to color text, so you can embellish your text with an additional 8 forground and background colors. Additionally, NerdTool allows displaying images, websites, and even Quartz composer files directly on the desktop. NerdTool needs a rating. Be the first to rate this app and get the discussion started!